President Bush was told in the months before the Sept. 11 attacks that Osama bin Laden's terrorist network might hijack U.S. passenger planes - information which prompted the administration to issue an alert to federal agencies - but not the American public. CBS News National Security Correspondent David Martin says the warning was in a document called the President's Daily Brief, which is considered to be the single most important document that the U.S. intelligence community turns out. The document did not, however, mention the possibility of planes being flown into buildings. White House spokesman Ari Fleischer said that while President Bush was told last summer that bin Laden's al Qaeda network might hijack planes, "until the attack took place, I think it's fair to say that no one envisioned that [using planes as suicide bombs] as a possibility." However, a federal report issued exactly two years before the Sept. 11 attacks contrasts with that statement. The report, entitled the "Sociology and Psychology of Terrorism: Who Becomes a Terrorist and Why?," warned the executive branch that bin Laden's terrorists might hijack an airliner and dive bomb it into the Pentagon or other government building. It described the suicide hijacking as one of several possible retribution attacks al Qaeda might seek for the 1998 U.S. airstrike against bin Laden's camps in Afghanistan. "Suicide bomber(s) belonging to al Qaeda's Martyrdom Battalion could crash-land an aircraft packed with high explosives (C-4 and semtex) into the Pentagon, the headquarters of the Central Intelligence Agency (CIA), or the White House," the September 1999 report said. The report was written by the Federal Research Division, an arm of the Library of Congress that provides research for various federal agencies under contracts. And it's come out that an agent in the FBI's Arizona office also speculated about using planes as weapons, writing in his case notes about Zacarias Moussaoui that Moussaoui seemed like the type of person who was capable of flying an aircraft into the World Trade Center. It was the observation of an agent taking notes as he thought about his case - an observation whose significance simply did not register at the time. Separately, the New York Times reports that an FBI agent in Arizona warned his superiors last summer that bin Laden might be sending students to U.S. flight schools. The FBI failed to make a connection between that warning and the August arrest of Moussaoui - a French citizen of Moroccan descent detained in Minnesota after raising suspicions among his instructors at a flight school where he said he wanted to know how to fly, but not how to land or take off. Moussaoui has emerged as the lone defendant charged in the aftermath of the attacks, which killed more than 3,000 people in New York, Washington and Pennsylvania. 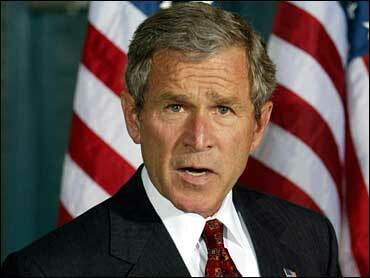 He is charged with conspiring with bin Laden and the 19 suicide hijackers to attack Americans. FBI Director Robert Mueller has said repeatedly that he wishes the FBI had acted more aggressively in addressing the Arizona and Minnesota leads. Mueller has also said that nothing the FBI possessed before Sept. 11 pointed to the plot. When hijacked airliners plowed into the World Trade Center, the Pentagon and a field in Pennsylvania, Middle Eastern men trained at U.S. flight schools were at the controls. According to Fleischer, after the information was presented to President Bush in August, the administration put domestic agencies on alert in the summer, just months before the Sept. 11 attacks. That alert was not announced publicly but Fleischer suggested it may have prompted the hijackers to change their tactics. "The administration, based on hijackings, notified the appropriate agencies and, I think, that's one of the reasons that you saw that the people who committed the 9-11 attacks used box cutters and plastic knives to get around America's system of protecting against hijackings," he said. Fleischer did not say which agencies were put on alert and what they did in response. On Thursday, National security adviser Condoleezza Rice described a series of threats uncovered by intelligence officials, beginning in September of 2000 and reaching a height in the summer of 2001, that dealt mostly with American interests overseas. Those threats prompted a series of alerts issued by the FBI to law-enforcement agencies and from the Federal Aviation Administration to the nation's airlines and airports, she said. There also were strong warnings to Americans to be careful overseas. Earlier this month, Senate Intelligence Committee Chairman Bob Graham complained that the Justice Department and CIA had not provided congressional investigators with adequate access to documents and witnesses for a probe into intelligence failures related to the Sept. 11 attacks. Graham said through a spokesman Wednesday that the revelations in the FBI memo mark an important discovery in Congress' investigation into why the FBI, CIA and other U.S. agencies failed to learn of and prevent the Sept. 11 plot. "It represents a failure to connect the dots," said Graham spokesman Paul Anderson. "This was dismissed rather lightly at FBI headquarters." On Feb. 6, in his first public comments after the Sept. 11 attacks, CIA Director George Tenet told a congressional hearing that the CIA had seen "spectacular threat reporting about massive casualties against the United States" in the spring and summer last year, but there was no specific information. A U.S. intelligence official, speaking on condition of anonymity, said the CIA had continuously informed policymakers throughout the summer before Sept. 11 that bin Laden and his network might try to harm U.S. interests and discussed a range of possibilities that included hijackings. "That was among the many things that we talked about all the time as a potential terrorist threat," said the intelligence official. "But when we talked about hijackings, we talked about that in the traditional sense of hijackings, not in the sense of somebody hijacking an aircraft and flying it into a building. We talked about concern about the general noise level about al Qaeda planning and we were trying to figure out what they would do. We never had specifics about time, place, MO (method of operation)."